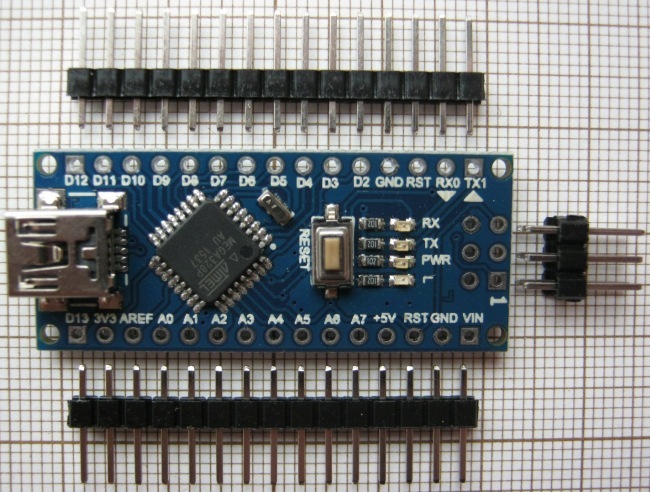 This module is one of the cheapest ($2.20) "arduino" boards, apparently almost exact clone of Arduino Nano 3.x - same form factor, same pinout, just different USB-UART bridge: CH340G instead of FT232RL and voltage regulator when using external power instead of USB: AMS1117 instead of LM78M05. CH340 supports following baud rates: 50, 75, 100, 110, 134.5, 150, 300, 600, 900, 1200, 1800, 2400, 3600, 4800, 9600, 14400, 19200, 28800, 33600, 38400, 56000, 57600, 76800, 115200, 128000, 153600, 230400, 460800, 921600, 1500000, 2000000 bps. As datasheet does not mention USB HS support I would assume that only USB FS is supported and highest baud rates are not sustainable (i.e. are limited by FIFO depth). Module I've received had arduino bootloader and blink example preloaded, so soldering ICSP (6-pin) header was not necessary. CH340G was recognized by 32-bit Windows 7 without the need manual driver installation. All you need is mini-USB cable so overall first experience is very good - example sketches from arduino work right from the start and there is no need to fiddling with any jumpers to enter/leave bootloader mode. With this simple sketch: scope.ino AVR/arduino streams 8-bit ADC samples continuously at roughly 23040 per second rate. Unfortunately there seem to be ~3% frequency error / data loss, so sampling frequency is not equal exactly to 1/10 of UART baudrate (230400) as expected. 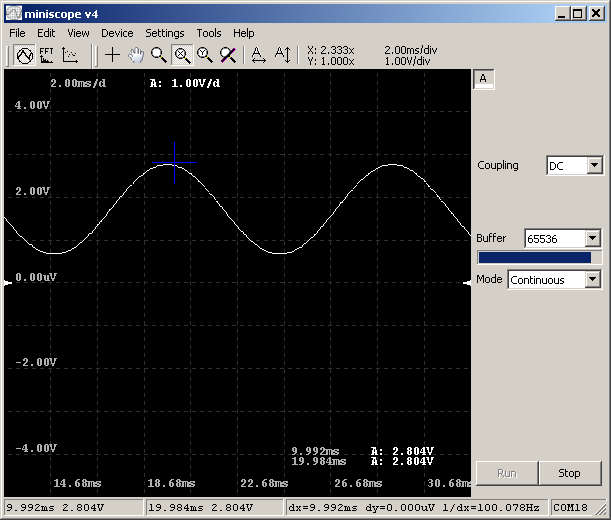 Same as with miniscope v2a-f key point is supposed to be continuous recording, not sampling speed. 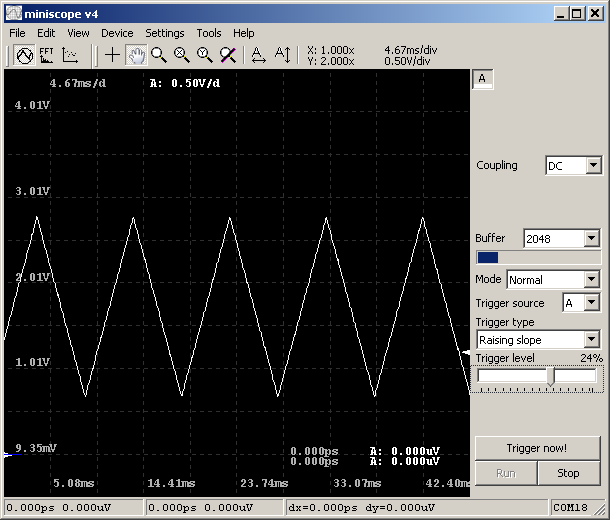 Overall it seems inferior to miniscope v2c (2x466ksps for only $1 more + cost of UART interface for programming) or maybe even cheap USB sound card if you can find one that can measure DC voltage same as mine, but might be useful if you already have arduino-like board. To use miniscope v4 with arduino (or any other hardware for that matter) interface dll is required, in this particular case I've quickly adapted bus_pirate.dll to work on 8 bit samples and with higher UART speed. As this dll is intended to be potentially usable with any other device streaming 8 bit samples as possible through serial port it has few configuration options: COM port number, baud rate and real sampling frequency in case serial port baud rate is not used in 100% (i.e. UART works faster than ADC samples are supplied). 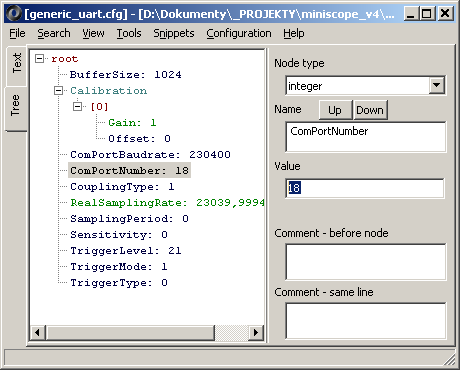 Generic_uart.dll is built with lightweight Code::Blocks/MinGW thus should be fairly easy to modify further.